We don't just carry zombie merchandise here at the Zombies Playground. 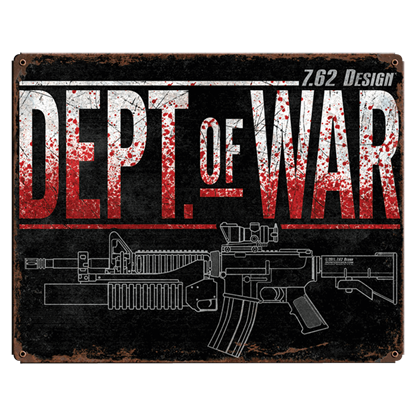 We also pride ourselves on carrying decorations and decals that are perfect for celebrating top zombie-killers - and none rank higher than trained soldiers, which is why we carry a wide assortment of Military Signs & Decals! Here in this category, you'll find a wide assortment of different decals, all of which feature a distinctive, All-American design that ensures each and every one is a tribute to the men and women who dedicated themselves to fighting for their country, against all enemies, foreign, domestic, and eventually, undead. Many of the military signs featured here are impressive decorations designed for wall hanging and are made from grade-A American steel. Combine that with their purely patriotic imagery, and you have a perfect match between material and appearance. And like our signs, our stickers celebrate soldiers from all branches of service, ensuring that we have stickers for those who love the Army, the Marine Corps, the Navy, and the Air Force! And since stickers can be used to decorate everything from windows to walls to cases, you can carry and display your militant style with you wherever you might go! And as an added bonus, these Military Signs & Decals have just the imagery to get you inspired, which will help you fight like a real soldier when you find yourself facing down the hordes of zombies! And who doesn't like the sound of that? Pick up a few signs and decals of your own, here at the Zombies Playground, to infuse some military style into your life and decor today! No mascot better represents the armed forces than the bald eagle. 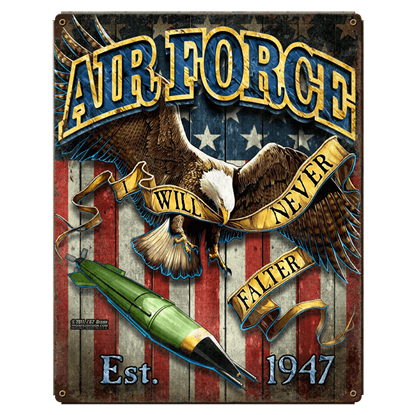 This king of the sky makes an unmatched, regal warrior to symbolize the U.S. Air Force, as shown by the design of the Air Force Fighting Eagle Vintage Steel Sign. This military sign promotes the fighting spirit bottled inside every U.S. Air Force aviator. 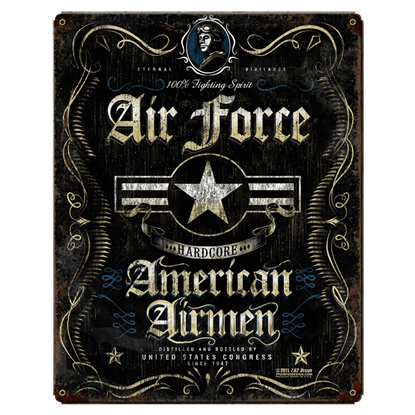 The Air Force Fighting Spirit Vintage Steel Sign resembles the label of a liquor that no enemy will want to take a shot of. 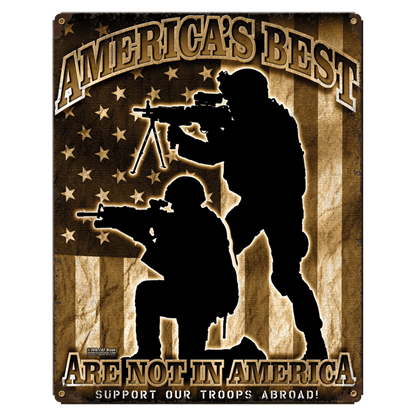 This military sign offers a fresh take on the phrase Support our Troops. The America's Best Vintage Steel Sign boldly declares that the best men and women of America are not here but fighting abroad to defend our interests. 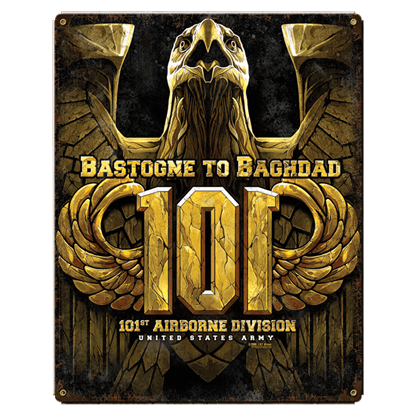 While every soldier deserves to be commemorated in one way or another, the Army 101st Airborne Bastogne to Baghdad Sign specifically celebrates the brave men and women who serve in the 101st Airborne army division. The Badge of Military Merit was authorized by General George Washington in 1782, eventually replaced by the Purple Heart. 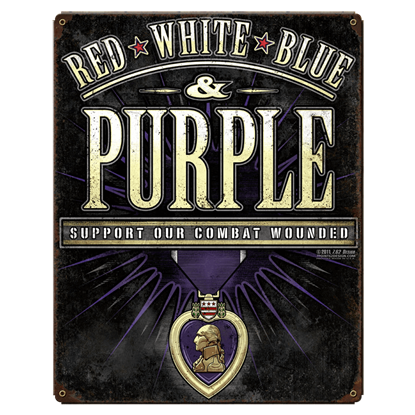 The Combat Wounded Purple Heart Vintage Steel Sign commemorates the medal and all who have earned it. Once upon a time, the United States of America did not have a Department of Defense. Instead, we had a Department of War! The Dept of War Vintage Steel Sign offers an eye-catching design inspired by this historical department. Just like you do not want to walk on a rattlesnake, you also do not want to cross the United States military. 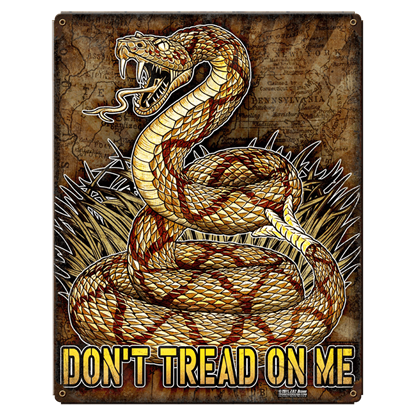 The Don't Tread On Me Vintage Steel Sign is modeled on the design of one of the earliest U.S. military flags. Patriotism can be demonstrated in different ways. Some talk about it, while others quietly show it. 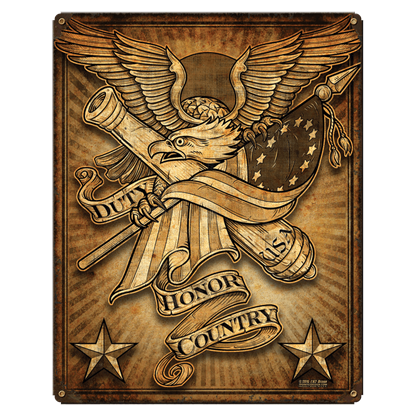 The Duty, Honor, Country Vintage Steel Sign offers one simple way to openly display your patriotism to casual onlookers. Honor. Grief. Hope. 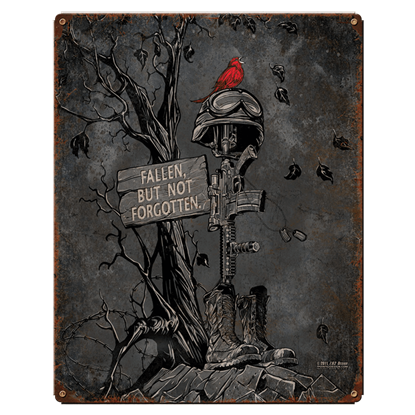 A battlefield cross evoking these emotions appears on the Fallen, But Not Forgotten Vintage Steel Sign. This somber memorial scene honors and recognizes the fallen and those who cherish their memory. 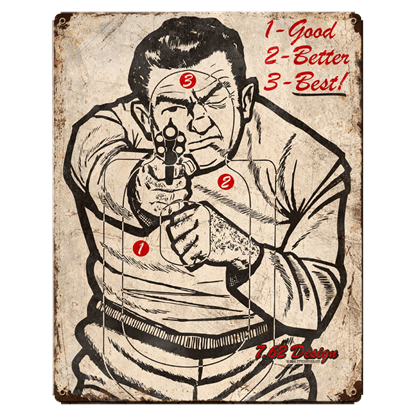 The Good, Better, Best Vintage Steel Sign offers a fantastic way to remind yourself where to aim when shooting. The gun target sign displays the outline of a practice target over the illustration of a man pointing a gun. 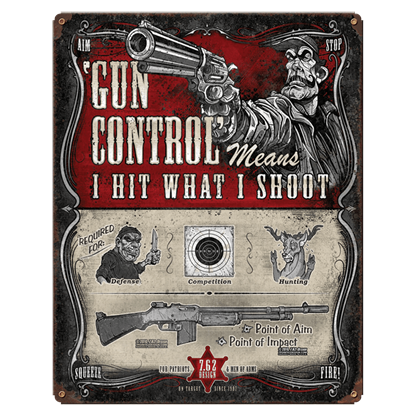 Show your commitment to Second Amendment rights as a responsible armed citizen with this tongue-in-cheek novelty sign! The Gun Control Vintage Steel Sign uses humor to illustrate a firm stance on the right to bear arms. This military sign has it all! 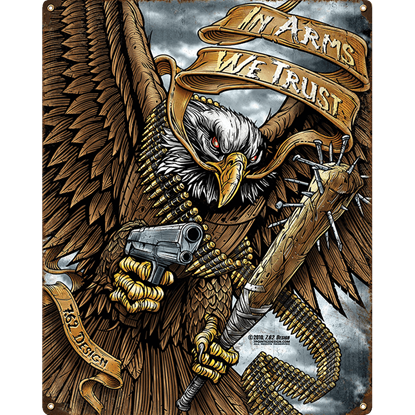 The In Arms We Trust Vintage Steel Sign graphically depicts surprise, speed, and violence of action, featuring an eagle as it swoops down, armed to the teeth and ready to protect freedom.